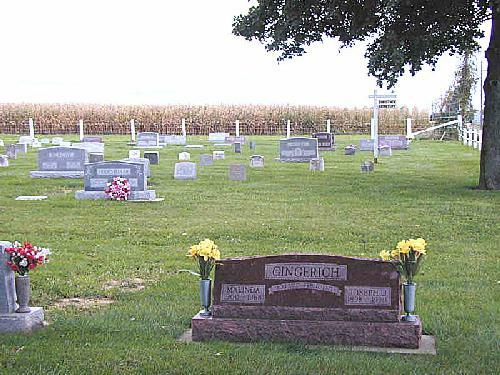 The Christner Cemetery is located in southern Miami County, Indiana, one-mile south and one-half mile east of Wawpecong. The cemetery lies on the Miami County side of the road dividing Miami and Howard Counties. Peter Christner, the original donor of the property, was born in 1823 and died in November 1894. Sarah Troyer Christner was born August 17, 1831 and died March 17, 1893. They are listed in two Hostetter genealogies compiled by the Rev. Harvey Hostetter. In 1876, the Mennonite congregation in Howard County built a church on a site two miles east of the existing cemetery. When the building became inadequate in size, it was purchased by a Dunkard Brethren Congregation and moved two miles west. That location was across the road from the existing cemetery, in Howard County. In 1888, a cemetery was started next to that church building. According to stories from past generations, a new owner of the farm in Howard County gave notice forbidding additional burials and also stated that he would disregard the burial site already begun. Apparently he also wanted the church building removed from the property. Peter Christner owned a quarter section of land in Clay Township, Miami County, just south and east of Wawpecong, and across the road from the cemetery. On August 24,1893, he transferred one half acre to the State of Indiana to be used as a public cemetery for the community. The bodies buried on the farm on the Howard County site were taken up and reburied in the newly formed Christner Cemetery. It may be noted here that Peter Christner's wife died on March 17, 1893 and was apparently one of the reburials. In January 1894, a new site was purchased for the church building that had stood beside the cemetery in Howard County before the cemetery was moved. The church building was moved to that site, one-mile east and one-fourth mile north on the Lewis Foust farm. The site was between the McGrawsville Road and Copper Creek, immediately north of the Marion-Delphi Road. The church was moved to this site, about ½ mile north of SR 18, from Beech Corner. In February 1923, the church was again sold, this time to the Amish Mennonite Conservative Church. Services were held there until the congregation disbanded in the early 1930s. On April 16, 1948, an additional one-fourth acre was purchased from Joseph J. Gingerich and added to the cemetery. On August 4, 1987, an additional one-fourth acre was purchased from Edward J. Otto and added to the cemetery, bringing the size of the cemetery to one-acre. This information is provided for non-commerical use only and may contain inaccuracies. Please report any inaccuracies to: Debby All photographs are copyrighted and may be used for personal use only. Do not post ANY photograph to Find-a-Grave or similar web sites, you WILL be asked to remove. If you do this, Find-a-Grave or similar web sites WILL BE REQUESTED TO REMOVE THE PHOTO.